Another little table topper finished. This one made from a Moda Sunnyside mini charm pack. 20.5″ square. Normally, I like to post stash results just once a month. But yesterday, I pulled out all my fabric yardage bins to take a hard look at some of the oldies that make me wonder what I was thinking. I’ve also had Mary’s Quick Strippie Quilt on my mind lately and I wanted to make up some quick donation quilts. 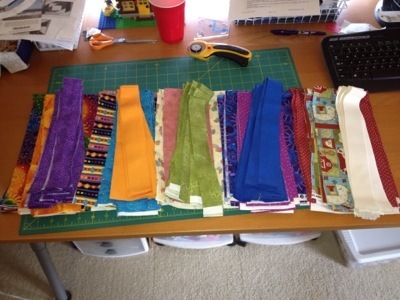 So I pulled and matched and pulled some more and ended the morning by cutting almost 10 yards of fabric to make five of the Strippie quilts. Of course this means I’ve just started five new projects. Linking up to Judy’s stash report.